The 2016 (Summer) Olympic Games concluded last night in Rio de Janeiro. Trends observed at previous Summer Games in terms of medal wins/success levels were also observed at the Rio Games, although there were some notable deviations from these trends, most notably in relation to the performance of Great Britain in outperforming their strong success levels at the 2012 Games, which were hosted by London. The USA continued to be the most successful state at the Summer Games in terms of medal wins. Indeed, the USA won their 1,000th Summer Olympics gold medal ever during the Rio Games. At the 2016 Games, the USA won 121 medals; amounting to 12.4% of all the medals being contested at these Games. This amounted to the USA’s highest percentage of medal wins at a Summer Games in 24 years – effectively being their best performance in terms of medal wins at a Summer Games since the 1992 Olympics in Barcelona (when the USA accounted for 13.3% of all medal wins). The next most successful state in these Games in terms of the medal table was Great Britain, with 67 medals and 27 gold medals, edging that state narrowly ahead of China, which accounted for 70 medal wins but just 26 gold medal wins. Russia and Germany completed the Top 5 in terms of the Rio Games medal table, although France were to win as many medals at these games as Germany did. In all, 86 states won medals at the 2016 (Summer) Olympic Games, with medals also being won (one gold and old bronze medal) by the Independent Olympic Athletes grouping. The 2016 Games marked yet another instance in which the Hosts achieved one of their strongest ever performances at a (Summer) Olympic Games. As Figure 1 shows, Brazil achieved their best ever medal-winning performance over the past nine Olympic Games in Rio; indeed the Rio Games amounted to Brazil’s greatest ever performance in terms of medal-wins at the Olympic Games. The general trend in terms of medal wins over the past few decades, reflecting trends at earlier Olympic Games as discussed in the previous post, has been for Host states to generally perform very well at the Games that they are hosting. Indeed Host states generally tend to win their biggest number of Olympic medal wins at the Games that they are hosting, as is also evident in the figures above for the USA (1984), South Korea (1988), Spain (1992), Australia (2000), Greece (2004) and China (2008) (Figure 1). There are some exceptions to this rule. The USA’s number of medal wins at the 1996 Games in Atlanta actually paled in comparison with that state’s number of medal wins at other Games across the 1984-2016 period. The other notable exception here relates to Great Britain. That country achieved a notable increase in their number of medal wins when hosting the Games in London, but also increased that number of medal wins further at the following Games in Rio. Indeed, Great Britain became the first state ever in the history of the modern Olympic Games to win more medals at the Games held immediately after a state has hosted the Games. Overall, however, the general trend is for states to peak their medal win numbers at the Games that they host. Looking at trends for states which hosted the Games between 1992 and 2008 (Spain, the USA, Australia, Greece and China), the average number of medal wins for these states at the Games held eight years before they hosted the Games was 38.4 medals, with this average number of medal wins increasing to 45.8 medal wins for the Games held just before they hosted the Games. These states’ medal win levels peaked, on average, at the Games which they hosted, with an average number of 59.4 medal wins at these Games. Medal win numbers tended to decline, on average, in the Games held after a state hosted the Games, albeit with levels remains somewhat higher than in the Games preceding the hosted Games. At the Games held immediately after they hosted the Games, the average number of medal wins for these states (Spain, the USA, Australia, Greece and China) fell to 50.4 medals, with that average number of medal wins falling further to 46.2 medal wins at the next Games after these. As will be noted below, the next country to host the Games (Japan) has experienced a notable increase in medal win levels at the Games immediately preceding the Games (Tokyo 2020) that they will be hosting. Drilling further into these numbers, it can be seen that larger countries (in terms of population levels) in the developed world generally tended to fare well in terms of Olympic medal wins in Rio, but the same rule did not apply to large states in the developing world, as evidenced in the previous point. 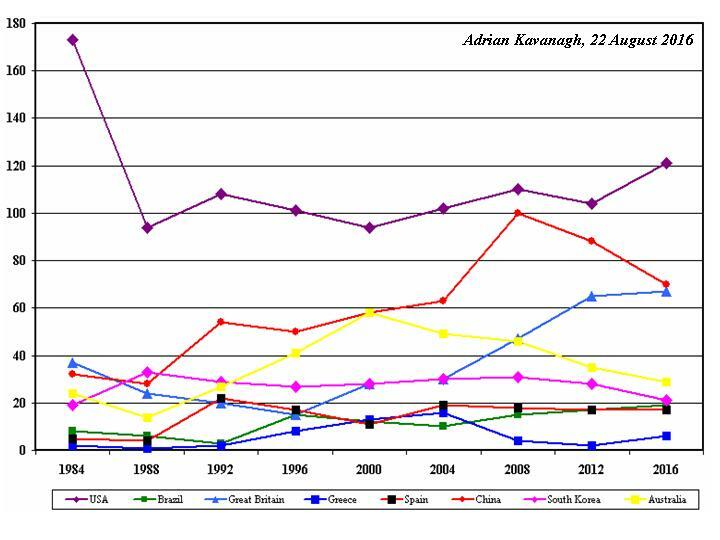 The differences in medal win levels between developed states/the “Global North” and developing states/the “Global South” is well evident in the fact that developed states/the “Global North” accounted for 74.3% of all medal wins at the Rio Games; almost three-quarters of all the medals won at these Games. This level actually marks a rather lower level of medal win success for developed states/the “Global North” as contrasted with the overall trend observed across the history of the (modern) Summer Olympic Games. Since 1896, developed states/the “Global North” have accounted for over five in six (86.4%) of all the medals won at these all of these Games. The number of medal wins by developing states/the “Global South” amounted to a level of around ten percent for most of the history of the modern Games, but the number of medals wins by these states increased from the 1980s onwards in lines with improving success levels for African states, such as Kenya and Ethiopia, in the athletics and the emergence of China as an Olympic superpower. Table 1 highlights the impact of economic development levels on Olympic medal win levels, showing the dominance here of Europe, but also North America – or rather the USA and Canada – Oceania (in particular Australia and New Zealand) and Japan. The level of dominance by the countries of the developed world, or the Global “North”, has declined somewhat during the 1990s and 2000s, especially given the rise of China as an Olympic Superpower and the growing dominance of long-distance running athletics events by east African countries, such as Kenya and Ethiopia. But, despite these recent trends, Table 1 shows that the states of the Global “North” came close to accounting for three-quarters of the medals won at the Rio 2016 Games, even though the vast majority of the world’s population is resident in the developing world, or the Global “South”. A number of states notably increased their number of medal wins at the Rio Games relative to the number of medals that they won at any of the four previous Games (Sydney 2000, Athens 2004, Beijing 2008 and London 2012). The most notable improvement here related to the USA, with that state winning 11 more medals that the number that they won at their best performance (110 medals at Beijing 2008) across the four previous Games. Other states that fell into this group (in order of improvement levels) were to include Azerbaijan (8 more medals than in their best performance at the four previous Games), Uzbekistan (7), Denmark (6), New Zealand (5), Croatia (4), Serbia (4), South Africa (4), Kazakhstan (4), Canada (4), Japan (3), Brazil (2), Cote d’Ivoire (2), Great Britain (2) and Malaysia (2). There is no particularly striking geography emerging here, although the list does include a number of Former Soviet states, as well as the most recent Hosts of the Games and the next state (Japan) to host the Games. By contrast, some states experienced a notable decline in their medal winning performances at the Rio Games relative to their performances across the four previous Games. Russia, for instance, won 17 fewer medals than the lowest number of medals that they had won (73 in Beijing 2008) across the four previous Games. Other states that fell into this group (in order of improvement levels) were to include Ukraine (9 fewer medals than in their worst performance at the four previous Games), South Korea (7), Australia (6), Cuba (3), Belarus (3), Romania (3) and Latvia (2). As well as including a number of countries that hosted the Games in the not-too-distant past (Australia and South Korea possibly still on a “come down” after the highs experienced in terms of medal wins at the Games that these states hosted), this list also includes quite a number of Former Communist states.